Die For Me by Amy Plum has such a gorgeous cover, doesn't it? I love the colour of it. And I especially love that this book is set in Paris! 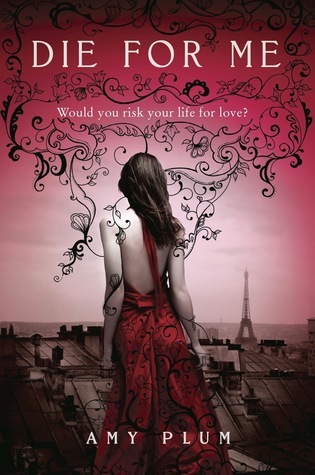 For the life of me, I can't think why there aren't more YA books set in Paris. What an absolutely beautiful and inspired setting for any story, but especially one so focused on romance as this book. I'd read quite a few reviews of Die For Me before reading Die For Me which had pointed out similarities in this to that of Twilight. And as I was reading, with that in my head, I could very much see certain aspects of both books that felt alike. But after some initial likenesses, I stopped comparing the two and was able to view this book on its own merits. And it is a very readable and enjoyable book. I really felt for Kate and her sister who are dealing with the recent death of their parents in very different ways. As they've moved to Paris to live with grandparents, Kate seemed to retreat within herself and within books whereas her sister preferred socialising and being around other people to distract her from her grief. I do love a good bookworm for a main character! When Kate is persuaded to leave the house and read somewhere else instead of her room, she comes across Vincent. Good-looking and mysterious and charming Vincent with a very big secret of his own which could spell danger for our Kate. They pretty quickly become involved, but is Kate's heart ready for a potentially harmful relationship so soon after the death of her parents? I had no idea what a revenant was before reading Die For Me, and I won't spoil it for anyone here, but I shall look forward to reading more about them in future books in the series! Despite the very lush setting, a different paranormal mythology to wrap my head around, and some fun and interesting side characters, this book didn't quite manage to grab me emotionally. I wanted more from Kate and Vincent's relationship, more tension, more build-up. There's still enough there to have kept me reading and I shall still look out for sequels, but it didn't have that little bit extra that I was hoping for. I get a bit annoyed when every book is compared to Twilight or to Harry Potter. The cover was what drew me to this book, the Paris setting kept me reading, and I am looking forward to reading more. I loved this book! That is all. I thought this one was awesome but I hope the sequels make your enjoyment of it grow! Marg - I do as well, usually. I only mentioned in the hopes that people don't further compare it to Twilight, but I don't think that worked out exactly as I'd hoped! Jenni - I've been reading a few paranormal books lately where the paranormal aspect is a bit of a surprise, and I'm really enjoying that. Raimy - I do as well! I enjoyed this book, but I'm ready to be blown away by further books in the series!